Nutrient-dense WholePrey™ ratios of poultry, organs and cartilage plus fresh whole fish and fresh whole eggs provide a natural source of virtually every nutrient your dog needs. Fresh meats are the foundation of our foods and all are delivered FRESH (refrigerated, without preservatives) or RAW (flash-frozen, without preservatives), then gently freeze-dried. Low-glycemic fresh fruits and vegetables maintain good digestive health and limit carbohydrates, while botanicals act as tonics and builders to cleanse your dog’s body. 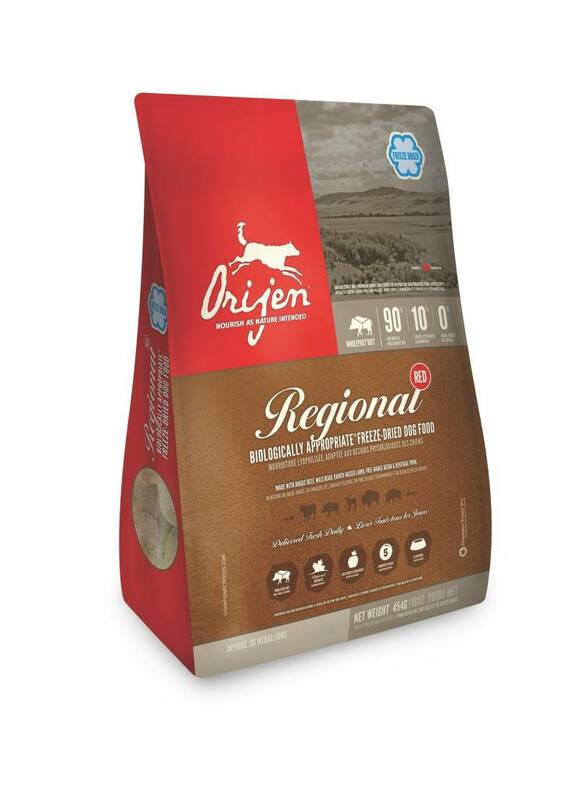 Quick and easy, ORIJEN Freeze-Dried Food takes only 5 minutes to prepare by simply adding a 1/4 cup warm water to each medallion and waiting 3-5 minutes for them to rehydrate. There are 20 nutritious and delicious servings for an 11lb dog in each 16oz bag, or you can break up a medallion and sprinkle it over ORIJEN dry food to tempt fussy eaters. Gently freeze-dried in our own kitchens without cooking or preservatives, to lock in natural, life-giving goodness and provide all the flavor and nutritional benefits of raw foods.